We need both serious and fun art if we want to capture the full range of human experiences. Wanuri Kahiu is an acclaimed artist and filmmaker who shatters conventional thinking about representation in African culture—by celebrating art that’s made for the simple joy of it. Kahiu creates work in her very own genre, which she’s coined “AfroBubbleGum”: an aesthetic mash-up of Marvel’s Black Panther and the candy store of your dreams. In talks, Kahiu shows why “fun, fierce and frivolous African art” is a political act, because seeing African citizens as healthy, financially stable, and fun-loving emphasizes their humanity in crucial, refreshing, and much-needed ways. “When I present my work somewhere, someone will always ask, ‘What’s so important about it? 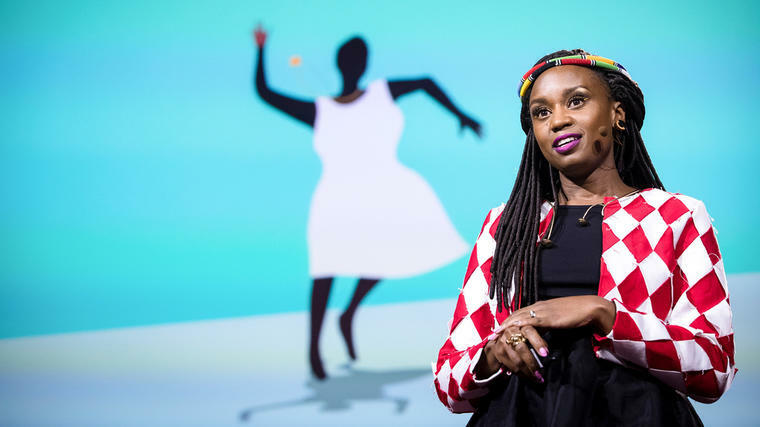 How does it deal with real African issues like war, poverty, devastation or AIDS?’ And it doesn’t,” says filmmaker and TED Speaker Wanuri Kahiu. “My work is about Nairobi pop bands that want to go to space or about seven-foot-tall robots that fall in love. It’s nothing incredibly important. It’s just fun.” And that particular, necessary attention to fun has landed her an amazing new project: teaming up with Stranger Things star Millie Bobby Brown, Kahiu will adapt and direct the celebrated YA novel The Thing About Jellyfish as a feature film, produced by Reese Witherspoon. And if that weren’t enough, Academy Award-winner Viola Davis has clinched Kahiu in making the Amazon Prime series Wild Seed, a drama series based on the first book in Octavia E. Butler’s acclaimed Patternist sci-fi series. “We couldn’t think of more perfect partners to bring Octavia’s feminist century-spanning epic to life than Viola Davis, JuVee Productions and the brilliant creative team of Wanuri Kahiu and Nnedi Okorafor” said the Octavia E. Butler Estate. In her vibrant, optimistic talks, Kahiu explains why showing fun is a political act in African film, when happiness is so often seen as a privilege. It’s important to find this balance in representing African stories, she says. We’re so used to narratives out of Africa being about war, poverty and devastation. Kahiu asks us to rethink the value of “all that is unserious,” and to make and support art that captures the full range of human experiences. Kahiu is the co-founder of AFROBUBBLEGUM, a media company that creates “fun, fierce and frivolous African art.” Her second feature film, Rafiki, was selected for the 2018 Cannes Film Festival, where it screened to acclaim. In 2009, Kahiu produced the TV documentary For Our Land about Nobel Peace Prize Laureate Professor Wangari Maathai for MNET, a pan-African cable station. In 2010, her science-fiction short Pumzi premiered at the Sundance Film Festival and went on to win best short film at the Cannes Film Festival and silver at the Carthage Film Festival in Tunisia. Pumzi also earned Kahiu the ‘Citta di Venezia 2010’ award in Venice, Italy. Her first feature film, From a Whisper, based on the real events surrounding the 1998 twin bombings of U.S. Embassies in Kenya and Tanzania, won Best Narrative Feature in 2010 at the Pan African Film Festival in Los Angeles, as well as five awards at the African Movie Academy Award, including Best Director and Best Screenplay. We’re so used to narratives out of Africa being about war, poverty and devastation, says filmmaker Wanuri Kahiu. What happens when we disrupt the expected narratives with stories of fun, whimsy, and romance? In this wonderfully buoyant talk, Kahiu introduces her self-invented genre of “AfroBubbleGum”—African art that’s vibrant, lighthearted, and pointedly without a political agenda. As she explains, showing characters who are happy, in love, financially stable, and healthy is an irreverent way of telling African stories, by virtue of how infrequently they are told. “Fun is political, because imagine if we have images of Africans who were vibrant and loving and thriving and living a beautiful, vibrant life,” she says. “What would we think of ourselves then? Would we think that maybe we’re worthy of more happiness? Would we think of our shared humanity through our shared joy?” Drawing on her love of science fiction and pop culture, Kahiu will show your audience why it is important to go against the grain to tell stories that complement, and sometimes even contradict the conventional stories we tell. If we do that—rethink the value of all that is “unserious”—we can learn to capture and see the full range of human experiences, in art, and in each other. Science Fiction Has Ancient Roots in Africa. Why Shouldn’t It Also Have a Future There?